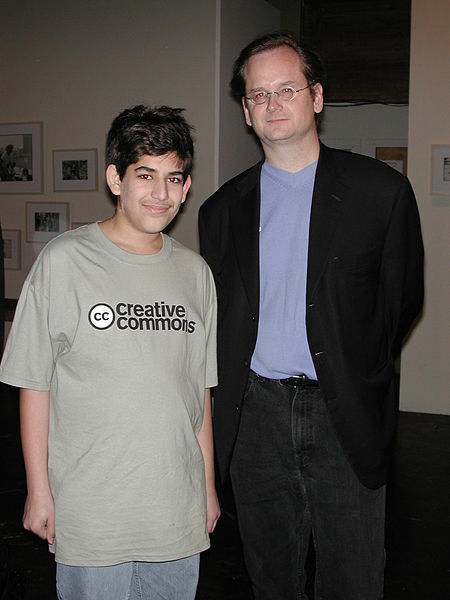 A week ago, I had never heard of Aaron Swartz. Today, I can’t stop thinking about him. A boy genius who would become a practical idealist. A man of profound curiosity who bent all his abilities towards repairing our world. An open-minded ascetic with an enormous heart. See his memorial page. Read his blog, it’s brilliant. Hear him talk about his campaign against SOPA. Matt Stoller: “Aaron came into our office to intern for a few weeks to learn about Congress and how bills were put together. He worked with me on organizing the campaign within the Financial Services Committee to pass the amendment sponsored by Ron Paul and Alan Grayson on transparency at the Fed. He helped with the website NamesOfTheDead.com, a site dedicated to publicizing the 44,000 Americans that die every year because they don’t have health insurance. Aaron learned about Congress by just spending time there, which seems like an obvious thing to do. Many activists prefer to keep their distance from policymakers, because they are afraid of the complexity of the system and believe that it is inherently corrupting. Aaron, as with much of his endeavors, simply let his curiosity, which he saw as synonymous with brilliance, drive him. It is hard to express here the heights of esteem in which I hold these individuals. I am a petty and materialistic savage compared to these people. Deep in my heart, I wish I could be one of them. They represent a world: a classless world, one defined as much by your electronic connections to the global humanity as by where you happen to keep your body. A world where wealth and power cannot be inherited and the quality of your character and your thoughts are what determine who you become. I looked at the adolescent Aaron–tan skin, short dark hair, uncomfortable being photographed, too-large t-shirt over an overweight body–and realized that I was looking at a picture of myself. I thought of Aaron, teaching himself to program over solitary weekends, frustrated by the shallow students at his school. I had had similar weekends and similar thoughts at a similar age, as I taught myself about computers and eventually built my own. I thought of Aaron, his intellectual curiosity taking him to intellectual territory far beyond the limited bounds of his regular school classes. I thought of myself, reading Dante in the spare moments between my classes, completely oblivious to whatever was the book currently assigned to my 10th grade english class. I thought of Aaron, after many painful years of struggle, eventually learning how to take care of his body, to keep it healthy and strong. I thought of my long adolescence of obesity and eating disorder, eventually re-educating and re-training myself to reclaim my body and my future. I thought of Aaron, gripped fiercely by the vision of a more fair and just society, and seeing technology as a lever to bring that fairness about. I thought of myself, dazzled by the possibilities, thinking those exact same thoughts. Looking at him, I couldn’t help but imagine his childhood running so parallel to mine. My accomplishments, of course, pale next to his, and I am unashamed to admit that his intellectual abilities likely far outclass mine. The shapes, however, are similar, and as I read I found myself feeling a sort of kinship with this man. I think I understand how Aaron Swartz understood the world, and the type of future that he knew was possible. Becoming aware of Aaron has stirred some inner coals, coals which I haven’t felt in years, and am surprised are still lit. His intellectual hunger reminds me of periods of my life where I would stay up until dawn consuming hundreds of Wikipedia articles, darting from topic to topic in a glowing frenzy of information. Up until very recently, my personality and direction very closely mirrored his. The “system” was broken, and I had nothing but stars in my eyes, for the world that we were going to build in its place. Matt Stoller, continued: “Aaron suffered from depression, but that is not why he died. Aaron is dead because the institutions that govern our society have decided that it is more important to target geniuses like Aaron than nurture them, because the values he sought – openness, justice, curiosity – are values these institutions now oppose. In previous generations, people like Aaron would have been treasured and recognized as the remarkable gifts they are. We do not live in a world like that today. And Aaron would be the first to point out, if he could observe the discussion happening now, that the pressure he felt from the an oppressive government is felt by millions of people, every year. Over the last few years, my vigorous idealism has been tempered, sometimes viciously so, in the forges of experience. In my time with the Cooperative, and in my personal life, I’ve had to deal with new and at times overwhelming disillusionment. Heartbreak, betrayal, broken confidences, apathy, unmet expectations, failed ventures, misguided zeal, loss, selfishness, and the physical limitations of the world have all hammered on what had been the intricate jewelry of my prior belief systems. You might expect me to say that my idealism was smashed, leaving me cynical before my time. That would be false; my idealism has survived, albeit in a new form, one more suited (I hope) to the challenges that we face. Whereas before the ore of my beliefs were as delicate jewelry, they’ve now been hammered into practical tools. Whereas Aaron and his fellow luminaries sought to avoid or work around the “system” (a shallow word that I hate to use, but it is widely understood), I’ve decided to do my best to engage with it, with everything I’ve got. I chose my future very deliberately. It was not a random decision, nor, I’d like to think, a shallow one. I rejected the life of working around our inexorable, grinding social and political institutions, rejected the life of rebellious creativity. I deliberately rejected it in favor of a life spent working within those same sad institutions, a life spent trying to inject those same values that Aaron championed into, in some small way, the institutions themselves. I made that choice for a number of reasons. First, over the course of my time in the Cooperative, I saw what the world looked like to those on the other side of power. As I moved through various positions of power and influence, I experienced the challenges of power, and understood how those with power are understood by others. I became aware of the huge perception gap that exists between those making decisions and those affected by them–those affected see clearly the weaknesses and failures of the decision as it was made, while those making the decisions understand the consequences of that decision in light of what could have been. I realized that while people absolutely can (and sometimes choose to) govern themselves, they quite simply usually will not. I saw clear as day, in dozens of places, how individuals naturally filtered into positions of authority and influence, rising largely due to their interest and vigor, while the majority contented themselves with taking orders and minding their personal business. The sum of all this was an understanding that while individuals, depending on their various points of view, can find in any system tremendous amounts of intention, in actuality there was none to be found. A network of minor uncoordinated interactions, in aggregate, gives the illusion of intention–but there is none. I could no longer get up in arms about “corrupt political institutions.” These institutions are the sum of people and circumstances, each one filling its role as its circumstances allow. These institutions are functioning more or less as their structure, context, and culture dictate. The idea of “corruption” is a red herring, as it presupposes an agency and intentionality which I no longer believe exists. The main lever available, I think, to make any kind of change is the lever of culture. And I don’t think you can reach that lever from the outside. Second, I became aware of two subtle fallacies in my overall thinking up to that point, which I think might be reflective of the kind of thinking common in my generation. The first fallacy concerns the life script that was modeled for us as we grew up, presented as an anti-script but a script just the same. It is the script of independence, of the following of dreams, of the rejection of the shortcomings of the generations before, of the achievement of personal ascendance, of rejecting the crowd. It came to us through many sources (children’s books and stories, literature in schools, music and film) which encouraged us to reject the dreams that others (family, authority, etc) would try to impose on us and follow our own. I want to be clear that I think this is a beautiful concept, very worth spreading across the entire globe. It should be scattered to every corner of the earth, as I think that this idea is the seed of freedom and progress. The problem with this concept is that it is taught to us as a narrative, in five acts, the last two of which are a lie. Acts I – III involve you rejecting the world from which you came, casting out on your own, and discovering your inner light and creative spark. They involve you rejecting the safety and certainty of the life you knew, in exchange for the exhilarating risk of complete independence, of forging your own way. The problem comes with acts IV and V. In act IV, things seem dark as our efforts seem to be bearing no fruit, and the noose of “reality” seems to be tightening around us. At the eleventh hour, in act V, the moral arc of the narrative begins to bend upwards and our hard works unexpectedly pays off, as some wealthy and/or influential deus ex machina recognizes our inner fire and elevates us to a position of stability and success (make note that regardless, the system has won). We are then acknowledged for the valuable being that we are, and begin to look forward to a lifetime of joy and self-actualization. The fallacy here is the connection between acts I-III and IV-V. We imagine it to exist, because we need it to exist. The moral arc doesn’t function without it, and the moral arc here is one of the pillars of our identity. But it does not. This isn’t to say that it never does–sometimes things work out exactly right. But the actual probability is low, and we are completely blind to this. We cannot even entertain the idea, except in jest. The fallacy made me realize how this dream isn’t really a rejection of the oft-maligned, hegemonic “american dream,” but rather a reformulation of the same dream. We aren’t smarter than our parents, rejecting their futile life spent running the rat race. We are running the same race, with “spiritual discovery” having taken the place of “material success.” We have placed ourselves under enormous pressure to reject dreams given to us by others (think about the meaning of the concept “selling out”), and compelled to create our own dreams from whole cloth. We have been given the dream of having dreams, but it is ultimately a received dream, and we are no less free to reject it than any generation before us. The second fallacy concerns the world of power and influence (government, business, etc). It is the idea that it is impossible to enter into such a world and to change it; you would inevitably be transformed by it before you could have any effect. For bright college students, this idea is presented slowly, in the form of revelation, so that students acquire it slowly and are able to construct some barriers around their prior idealism. Noam Chomsky is one of many who write about this phenomenon, and I there is much validity to it. Naturally, there is a filtering process by which individuals are selected based on their beliefs, attitudes, and views, and certain beliefs enable one to rise while others ensure the opposite. Two problems with this: The first problem is the implicit assumption that such a filtering is intentional and/or malevolent, that this selection process is conducted by individuals in positions of power to preserve their position and ensure the spread of their (read: neo-liberal, read: selfish and elitist) values in the world. The second problem is the implicit assumption that an alternative is possible. These two problems are deeply interconnected, and rest on this idea that individuals are in control. They are not. Culture is, and culture is a greater force than any individual or group, at least in the long run, and thus in the run of which I spend most of my time concerned (I apologize for that grammar, I couldn’t resist). This filtering is as natural as breath, and has been this way since human beings first learned how to think (which, depending on who you read, could be anywhere from a hundred thousand to a few thousand years ago). Social systems protect themselves. It’s what they do. It’s no one’s fault. Those problems, however, are not the fallacy that I’m talking about. The fallacy I’m talking about is that if one dislikes a state of affairs, then one should reject that state of affairs and remove themselves from it. I believe that this line of reasoning continues forward to suggest that if enough people remove themselves for long enough, the state of affairs would crumble. And this is true, in a technical sense. But on the scale of governments and economic systems, this line of thinking becomes complete fantasy. So, the fallacy: if I remove myself from the system, I am making things better, or at the very least, not making things worse. But no. Think about it. If I stayed away from that world, then that world would be populated exclusively with people with no such reservations, minimal awareness of the larger implications of their actions, people who felt they deserved the power and felt comfortable with the implications of our current system. By rejecting a system entirely, an individual in fact enables it to continue by helping to concentrate those interests in its survival. Rejecting a system such as ours does as much to ensure its survival as wholeheartedly accepting it. Reservations, even profoundly deep and existential reservations, are no reason not to engage with something, to engage with it completely wholeheartedly. Our political economic state of affairs is too massive to be affected by external activity at the roots, and too broad to be escaped. This leaves the third option, then: engagement, both physically and ideologically. If our target is culture, as I’m fairly certain it is, then the other options have been, at least for me, invalidated.